After dealing with a bout of severe weather this past Sunday, this week has quickly turned around to become a nice first week of Fall, even as temperatures return to the lower and mid 80s, a bit above the seasonal average for late September. Another cold front is on the approach, however, which will take this already nice week and turn it into an even better weekend! The front will move through the Mid-South Thursday night, but with the dry air over the region, rainfall will not be a concern with its passage, and even an increase in clouds will be hard to come by. Before the front’s effects are felt, Thursday afternoon could be a warm one across the area, with temperatures perhaps topping out in the upper 80s, but these are numbers not likely to return for quite a while. With the front moving out of the way Friday, high pressure with Canadian origins will begin to build in, just in time for the weekend. With it, the coolest air of the early Fall season is expected to follow. With a pleasant northerly breeze, Friday through Sunday temperatures will remain in the 70s, and many areas will not climb out of the lower 70s, especially on Saturday. Very dry air means clouds will be very tough, if not impossible, to find. As winds lighten during the nighttime hours, in combination with the clear skies, some cool nights are on tap. Temperatures will bottom out near 50 Saturday and Sunday morning, and its quite likely the suburbs and outlying areas fall into the 40s. Even as the new work-week begins, the pleasant, dry weather will only continue, as highs remain in the 70s with lows in the 50s through at least Wednesday. This may very well end up the best weekend this Fall will offer up (can’t imagine it much better! ), so don’t let it go by without getting out and enjoying it! 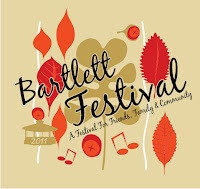 Among the many events on tap, MemphisWeather.Net, along with our recently-endorsed partners at Take Cover Storm Shelters, will be at this weekend's 2011 Bartlett Festival & Car Show! You can come out and meet the MWN and Take Cover teams, register to win a weather radio, and learn more about the products and services of both companies! 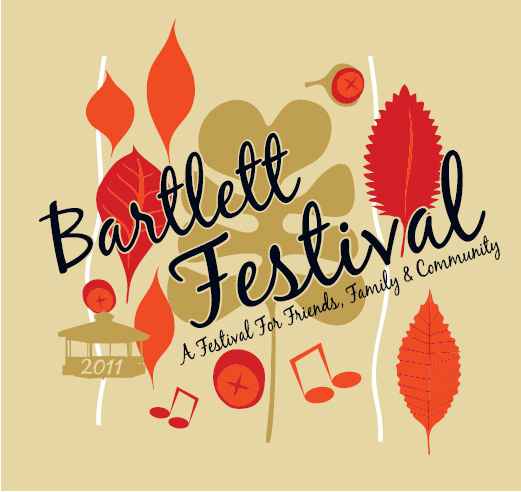 The festival is open from 6-10pm Friday night and 9:30am-5:00pm Saturday and will be held at W.J. Freeman Park on Bartlett Boulevard. It's been a while since the Mid-South was positioned in a Slight Risk of severe weather by the Storm Prediction Center. However, that is exactly what we find ourselves dealing with on Sunday. An unseasonably strong upper-level low pressure system is retrograding (moving east to west) from the western Great Lakes towards the Corn Belt over the next 24 hours (see upper left panel in the graphic below). Rotating around the upper low are a series of disturbances, one of which brought a band of light showers to the region early this afternoon. Another of these disturbances will be quite potent tomorrow and will be accompanied by a surface cold front. With a southerly flow ahead of the front today and tomorrow, increasing moisture is being carried north from the Gulf of Mexico. Due to the potency of the upper-level disturbance, thunderstorms will be likely along the front. A few of these storms could become severe, since the front will also be moving across the Mississippi River around the same time as peak heating on Sunday - late afternoon to early evening. See the lower left panel of the graphic below for the area where severe storms are possible. The main threats in this possible severe weather scenario will be large hail in discrete (individual) thunderstorms and damaging straight-line wind if the storms can congeal into a squall line. Tornadoes are not expected. The most likely time for severe storms appears to be from mid afternoon (after 2pm) through early evening (8pm) in east AR and from late afternoon (after 4pm) through midnight in west TN and northwest MS. MWN will be monitoring the situation and provide updates as conditions warrant. Severe weather nowcasting is planned for tomorrow on our Facebook and Twitter pages (linked below). GFS forecast for 7pm Sunday. Upper left: forecast at 500mb (18,000 feet), showing a very large closed low over IA/IL with upper -level disturbances rotating around it (purple-ish colors). Lower left: Storm Prediction Center outlook area for Slight Risk of severe weather on Sunday. Right: GFS precip forecast for 1pm-7pm Sunday, indicating showers/t'storms possible to likely. 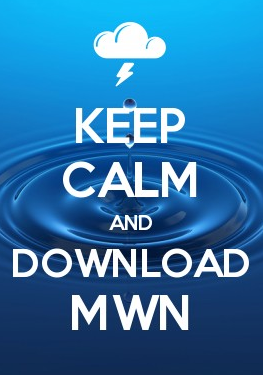 NOTE: The MWN iPhone app is currently not available in the App Store. An updated version of the app will be available early next week, complete with StormWatch+. For more on StormWatch+, visit this page on MWN. It was about as perfect of a start to fall as you could want it across the Mid-South! Temperatures today have been in the 70s with crystal clear sunny skies after the passing cold front last night that brought just a few showers, with trace to very light rainfall amounts at most in the metro area. For those who wanted more substantial rain, however, it appears to be in the offing before the weekend is over thanks to an unusually strong and large system in the Upper Mississippi River Valley that will help push another cold front into our region. Prior to that, tonight and Saturday will continue the great weather - perfect for the opening of the Mid-South Fair, the Memphis Tigers homecoming game, and any other outdoor events being planned. After lows in the 50s tonight, Saturday will see temperatures return to near the 80-degree mark. Meanwhile, to our north, a large area of low pressure at the upper-levels of the atmosphere is taking shape over the western Great Lakes and will strengthen over the weekend, while slowly moving west into the Upper Mississippi River Valley (see image below). This unseasonably strong and large upper-level low will help to drag a surface cold front closer, and eventually through, the Mid-South region. Clouds will first begin to increase on Saturday night, but it will remain dry. The same will be true for the first half of Sunday, but by the afternoon, an area of rain and thunderstorms will develop and begin to push in from the northwest along and just ahead of the front. This rain will likely impact the Memphis metro for much of the evening and night, as the cold front slowly pushes east. Rain will then begin to move out Monday morning as the front clears the area. Rainfall amounts could be moderate to heavy across the metro area, with computer models and National Weather Service guidance indicating between one-half to as much as 2 inches of rainfall possible (see image below). Any thunderstorms could lead to isolated higher amounts. While flash flooding will be unlikely, the rainfall may make for travel difficulties Sunday night and Monday morning, and may also put a significant damper on outdoor activities planned for Sunday evening. At this time, severe weather is not expected though. Drier air and clearing skies will begin to filter into the Mid-South later Monday into Tuesday as the upper level low to our north and cold front to our east begin to push further away, bringing a return to mild, early-fall weather. At this point, the remainder of the work week looks dry, with mostly sunny to partly cloudy skies, and high temperatures back in the 80s. Stay tuned to MemphisWeather.Net over the weekend for the latest on the increasing rain chances. In a previous post, I talked about a fantastic storm shelter company, Take Cover Storm Shelters, based in Hickory Withe, TN and operated by Jon and Jessica Everson. MWN proudly endorses this company if you are in the market for peace-of-mind during severe weather! Since the Eversons fabricate the shelters they install, the first step is ordering and receiving the steel used to make the shelter. They use 10-gauge steel and angle iron and square tubing dimensional pieces, which is all welded together to form the box, then epoxied to protect it from ground moisture that could cause corrosion. Bearings are installed to allow the 1/4" steel lid to open and close easily and holes are drilled in the lid pieces to allow additional ventilation beyond what is provided through gaps around the sliding lid. The entire building process takes a couple of days. On the day of installation, Jon arrives early in the morning, marks the concrete slab where the shelter will be installed, and begins cutting the slab. This process takes a couple of hours. By mid-morning, he is ready to begin digging the hole for the shelter to drop into using his mini-excavator. The mini-excavator allows him access to remove the cut concrete and dig the hole in the garage floor from outside the garage itself. Another couple of hours are spent creating the perfect hole. Assistance is provided by his father-in-law and cousin who hand-dig the last portion of the hole, gaining precision that is difficult to achieve with heavy machinery. I must say that everything done to this point is done with great care and precision. Jon goes the extra mile to minimize any damage to surrounding concrete, ensure the hole dimensions are precise, and make sure the work area is kept clean (or as clean as possible given that he is removing 10 cubic yards of dirt and concrete!). After the hole is prepared, Jon and team use the mini-excavator to lift, and lower, the shelter into place. Again, precision is important and the tape measure is used multiple times to guarantee that the shelter is squarely centered in the hole. By lunchtime, a mini-crete concrete truck arrives and begins pouring the concrete that encases the entire shelter in the ground. Not only is the shelter made of steel with a liberal layer of epoxy applied, it is also encased completely (even underneath!) in about 4-6" of concrete. That's what I call peace of mind! Once the pour is complete, Jon applies finishing touches to the top of the concrete to smooth it into the existing slab. Half of the lid is put in place and bolted down while the other half is installed on it's bearings to allow for quick and easy opening and closing. The carpeted bench seating and steps are put into place and the homeowner, in this case the very excited Morgan who now has a "new baby" in the family, receives a brief orientation and "trial run." Jon completes the job by thoroughly cleaning up the work area and providing the homeowner with a battery operated fan and a couple of battery operated lights for use in the shelter. I thoroughly enjoyed watching the Westbrook's shelter get installed and thank Brandon and Morgan for allowing me to observe and ask questions! Observing the process solidified our decision that Take Cover Shelters is worthy of the MWN endorsement. We do not take this type of decision lightly, as we know many of you trust us with your safety during severe weather. We greatly appreciate that trust and will only recommend those who we feel not only produce a high-quality product, but who we trust in the same way you do of us. We recommend Take Cover Shelters with no reservations! Visit their website (www.takecovershelters.com) or give Jessica a call (901-626-1691) for all of your storm shelter questions or to setup an appointment to tour one of their shelters. And be sure to mention MWN when you order yours for special offer! 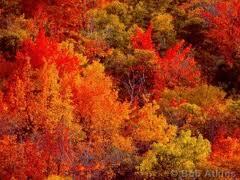 Autumn begins at 4:04am Friday - Happy Fall! It's time to put the summer of 2011 officially behind us! The June-July-August period ended up as the 3rd warmest "meteorological summer" in recorded Memphis history, behind 1980 and 2010. So far, September has brought a nice turn of events with an average temperature through the 21st some 2.3 degrees below normal, even though it has been dry (with the exception of the heavy rain earlier in the week). The autumnal equinox occurs tomorrow morning (Friday, September 22nd) at 4:04am CDT, thus marking the beginning of what we all hope is a pleasant (and LONG) fall! In the wake of a cold front tonight, Friday will feel much like fall with highs in the mid 70s and dry weather. Saturday morning's lows will be in the 50s all across the region. For a complete look at the MWN Forecast for the first week of fall, click here. In the past, we've fielded questions (during severe weather events primarily) about storm shelters. Do we suggest having one? How effective are they? Can we recommend a particular company? So far, the answers to these questions have been: yes, if you can afford it we suggest one; they can be very effective, especially for those looking for some piece of mind when sirens are sounding (besides keeping you safe in an actual tornadic event); and no, we don't have a recommendation. The answer to the final question has now changed! MemphisWeather.net is now pleased to endorse a fantastic local company with a unique business model that saves you - the customer - money on a high-quality product. That company is Take Cover Storm Shelters (http://www.takecovershelters.com). Take Cover Storm Shelters is owned by David Carson and operated by his daughter and son-in-law, Jessica and Jon Everson of Hickory Withe, TN. They are a great family and are very customer-centered, making sure that each shelter recipient is fully satisfied with the entire process and purchase. We'll have more on their shelter installation process in a separate blog post, but we want to tell you more about the Take Cover business model. As with many small businesses, it started as a way to fill a need. Jon and Jessica have small children and Jessica was afraid of storms. She worried about her young family when the sirens sounded and tried to overcome that fear with information from local TV sources, the internet, etc. It wasn't enough, and she and Jon determined that a family storm shelter would provide peace of mind. Others found out they had a shelter installed and they inquired about getting one for themselves. It was soon thereafter that the Eversons decided an opportunity had arisen and began Take Cover Shelters as a small business. For the first several shelter installations, the Eversons purchased pre-made shelters from a company in Oklahoma (where he also was trained on the installation process), transported them to Memphis, and installed them at the customer's homes. Soon though, they discovered that they could increase profits, while also decreasing the sales price, by manufacturing the shelters themselves. Jessica's father purchased the company from them, allowing Jon and Jessica more freedom to run the day-to-day operations. (David also assists in building and installing the shelters.) Jon again went to Oklahoma to learn the fabrication process and came back armed with knowledge. They now control the entire process themselves, from manufacturing the shelters, to installation, to final cleanup and training the homeowner. By using this model, they can be assured of a job well done, tweaking the process for efficiency, while also saving the customer money by not outsourcing any part of the process. One other unique part of their business model is that a percentage of the profits from each sale go to charity. The customer is asked to select a Christian-based charity from a pre-determined list of the Eversons favorites, including Compassion, New Tribes Missions, Christian Relief Fund, Prison Fellowship, Samaritan's Purse, and Young Life. The chosen organization is sent a check upon completion of the installation! Jon and Jessica feel like this is their way of giving back and enables them to support some charities that they are passionate about. A Take Cover storm shelter is constructed of welded 10 gauge steel with a 1/4" steel lid, and is placed in the ground, usually in the homeowner's garage floor, in one day. It is accessible even with a car parked above it, installed flush to the garage floor, is easy to operate, and engineered to withstand a direct impact by a violent tornado. (In fact, the engineering report on their shelters indicates that they will withstand loads three times the federal requirements.) We'll have more details on the shelter itself and the installation process soon. In the meantime, we strongly encourage you to check out Take Cover Storm Shelters (901-626-1691) if you are considering the purchase of a storm shelter. You have our assurance, you will not be disappointed! Tell them MemphisWeather.net sent you for a special offer! A wet start to the week, but "fall-like" weather to arrive for the official start of autumn! This week has started on a wet note, with showers and thunderstorms occurring for much of the first half of Monday, associated with a cold front now moving through the region. Many locations in the metro area have seen more than an inch of rainfall in the last 24 hours. 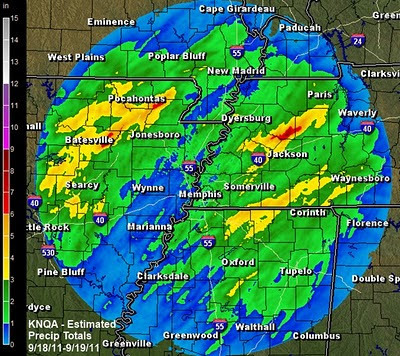 Just to our north, especially across portions of northwest Tennessee, Doppler radar estimates and spotter reports indicate a whopping 3-6” of rain have fallen (see image below), which led to isolated morning flash flooding in Milan. The rainfall did help to greatly reduce a growing monthly precipitation deficit that had been adding up here in Memphis for September. 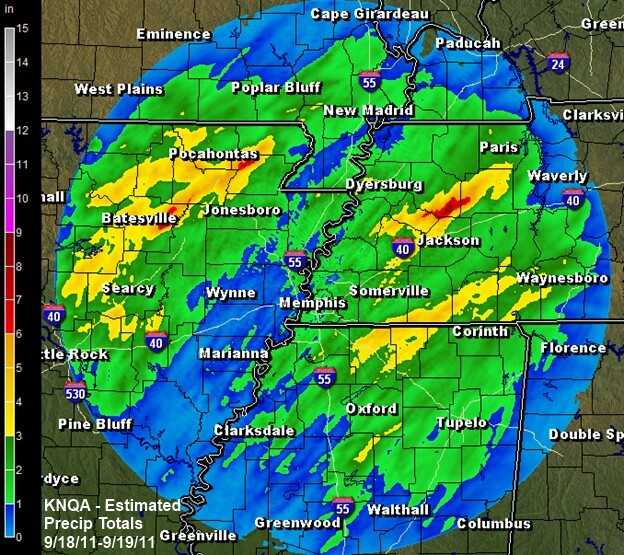 Memphis Doppler radar estimated rainfall totals since Sunday Morning (9/18). estimated in NE Arkansas and NW Tennessee. Even as the cold front moves past the region tonight, its influence will be slow to leave as it eventually stalls just to our southeast for the next 24-36 hours. This will help prevent dry air from building in behind the front, keeping some clouds and a very small chance of rain around Tuesday into Wednesday. There may also be some overnight and morning fog to contend with late tonight and early Tuesday, so motorists should be prepared to slow down and drive with extra caution if they run into areas of reduced visibility. Temperatures will be near their late-summer average, in the low to mid 80s for highs and mid 60s for lows. The remnant cold front will wash out completely by Wednesday, but the next storm system to affect the region will not be far behind, bringing another increased chance for rain, particularly on Thursday. 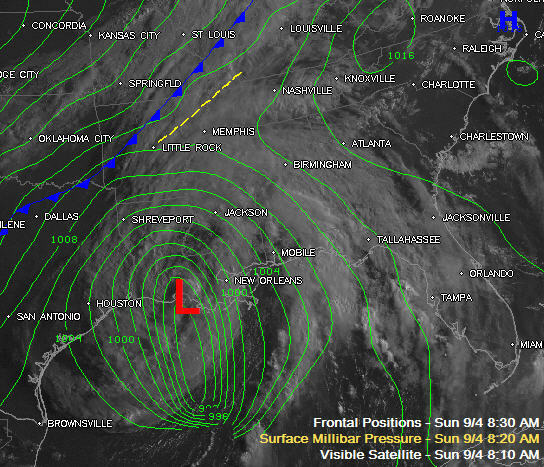 This front looks as if it will have more “push” to it thanks to strong high pressure building in it's wake. It will clear the region quickly, allowing for a great, and perfectly-timed, first day of fall on Friday (with the autumnal equinox occurring at 4:04 am). The fantastic weather looks to continue on Saturday. Highs and lows will be back in the 70s and 50s, respectively, just below the now early-fall average, with mostly sunny skies. Any outdoor activities or events being planned appear to be in great shape at this point! Uncertainty returns to the forecast by Sunday into early next week. A strong upper level system will take shape in the Great Lakes region, and may bring impacts to our weather for Sunday, Monday, and possibly beyond, in the form of cloud cover and rain chances. Confidence in this scenario is low at this time, however, as computer models disagree on their handling of this system. Future forecasts are subject to change in this period. For the full and up-to-date forecast details, visit MWN. After a nearly week-long stretch of beautiful fall-like weather and temperatures well below normal, summer has made its presence felt once again across the Mid-South, with temperatures returning back to the 90-degree level Monday for the first time since September 3. Fortunately, our next cold front is not far off in the future, which will keep summer’s return brief, and also bring our next decent chance for rainfall. Before that, another couple of warm days are expected. After a low in the upper 60s Monday night, temperatures will again reach the lower 90s on Tuesday. Humidity levels, though perhaps slightly higher than Monday, should still be tolerable, keeping the heat from becoming oppressive. By Tuesday night, increased moisture and cloud cover will begin streaming back into the region ahead of the approaching cold front. One more warm day is expected on Wednesday with temperatures back near 90, but the chance for a few showers and thunderstorms will enter the picture as the front pushes closer during the day. The best chances for rain and scattered thunderstorms look to be on Wednesday night into Thursday as the front moves through the metro, which could make for a wet morning rush hour. As the front clears the region Thursday night, high pressure will begin to build in, though a few upper level disturbances may keep some clouds and a slight chance for a few showers around into Friday and early Saturday. Dry conditions are then looking on tap for the remainder of the weekend, before rain chances may see a return early next week. The front’s passage Thursday means the much cooler temperatures will be back, with highs in the 70s on Thursday and Friday, nearing 80 by Saturday. Lows will also be at very pleasant levels, with readings near 60, and 50s possible especially in the outlying areas. Temperatures will rebound back into the 80s Sunday and next Monday. For full forecast details, visit MWN. The map below shows the 7-day total precipitation encompassing the first week of September through this morning at 7am. As you can see Tropical Storm Lee and it's remnants brought remarkable amounts of precipitation to the Gulf Coast states and Tennessee Valley, thanks in large part to it's very slow motion. While Memphis locations generally received under a half-inch, parts of northeast Mississippi received over 6" of rain! Many locations in a swath across LA, MS, the FL panhandle, north AL, and east TN received 8"+. Below the map are selected rainfall totals for the storm, as reported to the NWS. I'd like to take this opportunity to officially welcome the newest part-time team member to MemphisWeather.net. Up until this point, I have been posting on this blog, writing the forecasts, doing all of the web updates, updating MWN social media during storms (and all other times), and washing the dishes. OK, maybe not the last part... I'm also now heavily involved in developing the MWN apps, strategic planning for the future, marketing, and planning and implementing public appearances. I've been very fortunate to have people like Ben Deming, our amazing Android and iPhone app developer, come alongside, as well as getting some wonderful marketing assistance from an unnamed, but VERY talented and generous, local firm. I've realized that to keep MWN going and growing, I need some help. This is hard to accept for a control freak that has done it alone for a number of years! However, I can't continue at this pace and still have a family and (albeit mediocre) social life, as well as be involved in other activities that are important to me. So, I reached out to the college community and believe I found a winner! Kevin Terry, a senior at the University of Memphis in the Geosciences department is a lifelong Memphian and big fan of weather, especially severe weather. His interest in weather began as a young boy and has continued to grow and develop through the years. He has taken coursework in weather and climate and intends to pursue a graduate degree starting next fall in Professional Meteorology. His experience includes two years as a student volunteer at the National Weather Service in Memphis, where he has received high praise for his work. He is adept at communicating via the internet, serving as an Administrator for the 1000+ member Tennessee Weather Forum (www.TennesseeWx.com) and also has several years experiences in radar interpretation. Kevin will serve as "Social Media Nowcaster/Intern" for MemphisWeather.net this fall and his responsibilities will include providing real-time weather updates on MWN's social media feeds, as well as writing a blog post or two each week, primarily discussing upcoming weather events. Kevin is competent, enthusiastic, and a quick study and should allow me to focus more fully on growing the MWN brand in the coming months. I will continue, though, to make my presence known on social media and will continue nowcasting during severe weather outbreaks (with Kevin's help)! Please help me welcome Kevin (/KT on social media posts) to the MWN team! Tropical Storm Lee made landfall (if you can call it that, moving at 2-3 mph) over south-central Louisiana this morning and will move slowly northeast over the coming couple of days. It's effects, in the form of a dense high overcast sky, moved across the region yesterday. By this afternoon, we'll begin seeing scattered showers from Lee with northeast MS receiving the heaviest and steadiest rain. In the meantime, a cold front to our northwest will continue to move southeast into the metro area by this afternoon. It is also expected to bring with it scattered showers and possibly a thunderstorm. Between these two systems, we'll have a good chance of rain this afternoon and evening and overnight tonight. No severe weather is expected. Conditions will also be breezy tonight as Lee's wind field stretches over the area. For Labor Day Monday, weather conditions will improve with little in the way of rainfall expected, so outdoor grilling can commence! It could remain mostly cloudy, at least through the first part of the day, before skies begin to clear late. The airmass behind the front is much cooler and we'll see our first taste of FALL on Monday with temperatures remaining in the 70s! Lows will drop into the 50s area-wide for lows Tuesday and Wednesday mornings. High temperatures will remain in the 70s Tuesday and Wednesday and near 80 through the end of the week. It certainly will be a welcome change from the blistering hot summer that seems to have ended on Saturday! For full forecast details, visit MWN. While the June-July period averaged 84.9 degrees (tied with 1980 as the warmest June-July on record in Memphis), August's temperatures were slightly cooler than July overall and brought the "summer of 2011" average temperature down slightly to 84.6 degrees, which ranks as the 3rd hottest summer in recorded Memphis history behind 1980 and 2010. Record temperatures for the month are listed in the table below, followed by the Top 5 warmest summers. Precipitation was near average for the month. The average temperature for the month of August was 83.9 degrees, which was 1.9 degrees above normal and just over 2 degrees cooler than July. The average high temperature was 93.0 degrees and the average low was 74.9. The coolest temperature of the month was 67 degrees on the 15th and the highest temperature was 106 degrees on the 3rd. Precipitation for the month of August totaled 3.08", which was 0.20" above average. Climatologically, August is the driest month of the year in Memphis. There were 9 days with measurable rainfall; 3 of those measured more than one-half inch. The greatest 24-hour total was 0.85" on the 20th-21st. The peak wind gust was 52 mph in a thunderstorm on the 12th with an average wind speed for the month of 6.0 mph. Click here for a daily statistical recap for Memphis International Airport. The average August temperature at Cirrus Weather Solutions in north Bartlett was 81.2 degrees with a maximum of 105.1 degrees on the 3rd and a minimum of 59.9 degrees on the 15th. August precipitation was about half an inch less than the Memphis airport, totaling 2.51". A co-located manual gauge used for the CoCoRaHS program measured 2.42". The peak wind gust was 25 mph on the 12th. Average relative humidity was a high 72%. Click here for a daily recap on MemphisWeather.net. For the month of August, the average temperature error in all MWN temperature forecasts was 2.88 degrees, lower than all compared computer models and the NWS by 7% or more. Over 50% of the MWN temperature forecasts for the month were within 2 degrees of the actual temperature. MWN's forecasts extend out five periods (or 2.5 days). For dewpoint accuracy, the MWN forecast beat all data sources, averaging 2.36 degrees error and falling within 2 degrees of the actual dewpoint nearly 60% of the time. Historical accuracy statistics can be found here. Recently-upgraded Tropical Storm Lee is meandering ever so slowly over the northern Gulf of Mexico, roughly 180 miles west-southwest of the mouth of the Mississippi River as of 7pm CDT Friday. Maximum sustained wind has increased to 45 mph today and will increase a little more as it creeps towards the south-central LA coastline over the next 24-36 hours. Landfall is expected in LA overnight Saturday night before the center of Lee moves directly over New Orleans by Monday morning and then to a point in central AL by Wednesday as it gets absorbed into a frontal system. See the current track from StormPulse (my tracking site of choice) below. Because the storm is moving so slowly, the track is still a little uncertain, especially past 2-3 days. 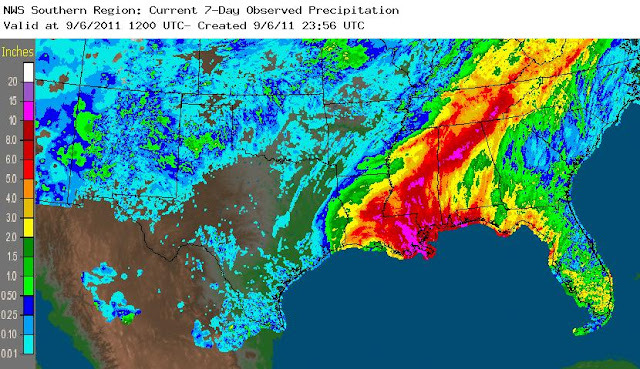 The one thing that is certain is that the Gulf Coast - from Louisiana to the Florida panhandle - is going to get unbelievable rain totals. Many locations will see 12-16" of rain, while some totals from today through early next week could be well over 20"! For an area that needs rain pretty badly, this might actually be too much of a good thing! 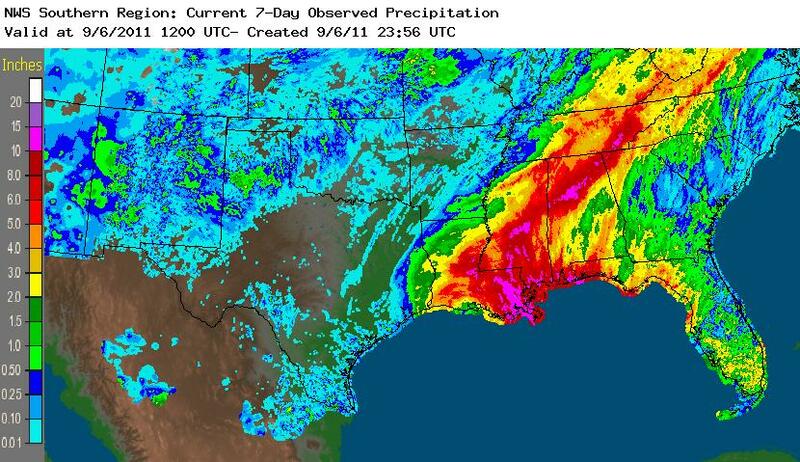 5 day total precipitation from the NWS. A maximum of 23.2" is predicted from Lee, centered over New Orleans, LA. 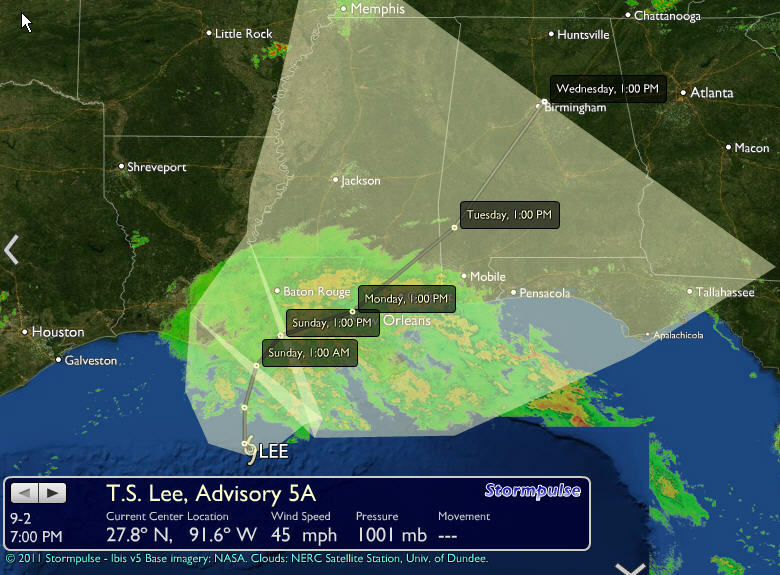 How will Lee affect Mid-South weather? It ultimately depends on the track and speed of the storm. Computer models are now coming into agreement that areas east of Memphis (west TN closer to the TN River, as well as northeast MS) could see at least a few inches of rain, if not more. The metro area seems to be right on the edge of the precipitation shield from Lee. The one fly in the ointment is a cold front that will be moving through the region on Sunday. Scattered showers and thunderstorms are expected along the front as it encounters the warm, moist air provided by the Tropical Storm. This will bring welcome rain to many places on Sunday with cooler temperatures as well - mid 80s in the metro. If T.S. Lee moves far enough north, the metro area could get a pretty good shot of rain Sunday night into Monday as well. One thing that seems a little more certain is the cooler air behind the front. We're forecasting highs only in the 70s Monday through Wednesday, as opposed to the upper 90s of the past few days! That in itself (rain or not) will be a welcome relief as summer winds down in the Bluff City! We'll be keeping you updated via Facebook and Twitter (links below) over the weekend as Lee's future becomes a little less "cloudy." In the meantime, have a fabulous Labor Day weekend and ready Plan B in case the grill gets wet on Monday!